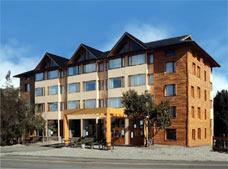 These spacious apartments are a great choice for those seeking a comfortable stay in Bariloche. Each apartment features charming rustic decor and a warm, inviting atmosphere as well as a great selection of quality amenities. These beautiful accommodations are equipped with everything you need to have a comfortable and relaxing stay. This room features warm, rustic decor and offers incredible views of the park. Guestrooms are warm and comfortable, well lit and with contemporary Patagonian decor. Aside from having multiple services, being spacious and comfortable, they are perfect for resting and relaxation. These warm and comfortable guestrooms feature contemporary Patagonian decor. Each spacious room comes with great amenities and services. This tranquil and relaxing guestroom features a warm atmosphere and beautiful lighting. Each spacious room comes with everything you need to enjoy your stay.